Gamers' decisions will shape the world. Adventure and role-playing games have always focused on telling stories, and that tradition has permeated into almost every other genre. Whether with linear plots or with branching, adaptive tales, developers are putting story everywhere. And just as the technology powering games is evolving, so too are the narratives within them. One game, however, is pushing forward into entirely new territory: City of the Shroud. 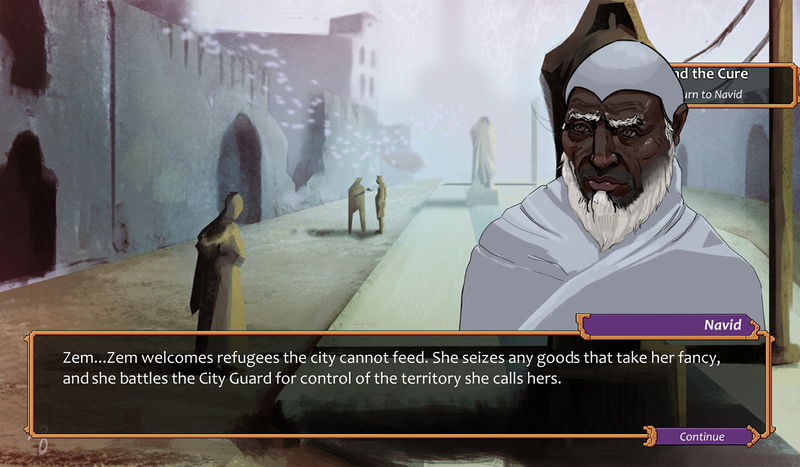 Partially funded by a small-scale Kickstarter campaign earlier this year, City of the Shroud is being developed by Abyssal Arts, a small team strewn across the US and UK, with some assistance from Japan. It's a hard game to categorize. 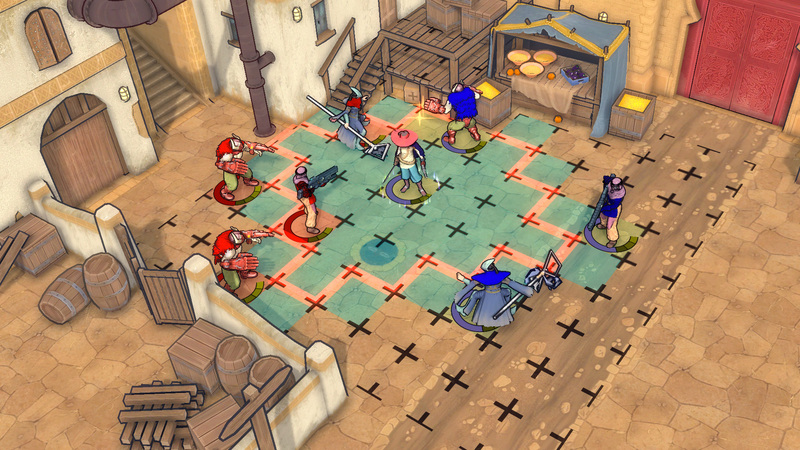 It's an RPG, yes, but it blends tactical elements from X-Com, The Banner Saga and Final Fantasy Tactics with a real-time combat system that borrows from classic fighting games. 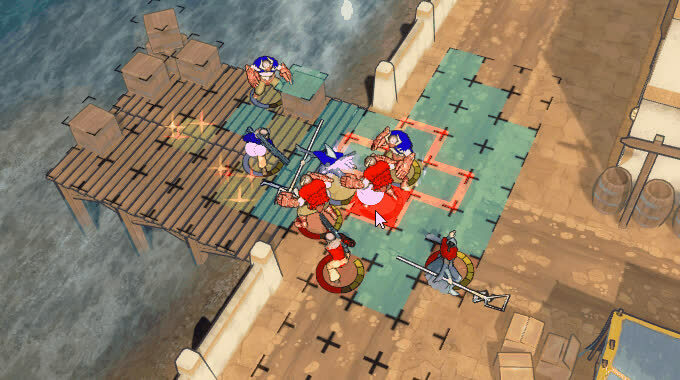 There are no "turns" in City of the Shroud; instead, combatants all generate action points in real time that can be used whenever you like to either move or strike an opponent. Attacks themselves are performed using an upgradable combo wheel, which is a little like Street Fighter. As in Capcom's famous series, you use the wheel's "d-pad" to input commands (down, left, up, etc. ...) for special attacks, and you can put them together (if you have enough action points) to pull off combos. There are multiple classes of character, each with their own moves, strengths and weaknesses, to combine however you please. Controlling them at the same time makes for challenging battles. Between the frantic bouts of combat, the game presents itself much like a visual novel -- you'll converse with the residents of Iskendrun, the titular shrouded city. It's isolated, and on the brink of civil war, with potential leaders squabbling for control. Something bad is coming, though, and someone in the city knows about it. As the archetypal hero, you'll have to work out whom you can trust, choose whom to ally yourself with and whom to fight. But you are just one hero, in a city of thousands. While City of the Shroud's world, its inhabitants and the broad plot line have all been devised already, where the story goes will depend on players. Throughout the game, they'll be making decisions in the visual novel side of the game, aligning with different factions, supporting and betraying whomever they please. After the first chapter, though, those decisions begin to affect the world as a whole. Abyssal Arts is collecting gameplay data from each player, pooling it together and then reshaping the political landscape of Iskendrun around it. "We wanted to give your decisions consequence, [and] we wanted the choices of the players and what was going on in your game to have consequence for everyone else," Keaton White, the game's director, explained. White has AAA experience in the industry, having spent four years in Japan at Capcom as a production manager, working on the Dead Rising series and the upcoming action RPG Deep Down. He's now based in Brighton, England, where he founded Abyssal Arts. Together with author Moira Katson, whose self-published works have hit the top of Amazon's Sci-Fi/Fantasy charts three times in three years, and programmer Ryan Becker, White created City of the Shroud. "We wanted to give your decisions consequence, we wanted the choices of the players and what was going on in your game to have consequence for everyone else." Iskendrun can be divided into five factions, and the leaders of each are the main characters driving the story forward. At the start of the first chapter, each player aligns with one of those groups, and begins to uncover the story from that perspective. The decisions they make throughout the game -- including, at one point, whether to defect to another faction -- will directly influence their experience, as you'd expect, but after the chapter is done is when things will get really interesting. After an undetermined amount of time -- likely around two months -- Abyssal Arts will close what's referred to internally as "the influence period." The chapter will still be playable, but decisions won't influence the plot, and the team will begin to pore over the data. They're playing their cards close to their chest with regard to which decisions will influence the story. "It's not always going to be obvious that you're at a feedback point," explained Katson. "Little choices and comments you make may weaken your leader's standing with allies or in the city as a whole." There will be huge decisions to make, and those might be more conspicuous, "but then there will also be smaller decisions that shade the tone of how I write certain events." Of course, Katson already knows the meat of the story. "We know the antagonist, we know the events that are coming down the pipeline," Katson affirmed. But at the core of the story is a complex political landscape, and the strength and aims of each faction within will dramatically change how the city responds to these events. The city, as it were, is a "living organism," whose reflexes are attuned to the actions of the players within. "Characters will get pushed to extremes in various ways" depending on what decisions gamers make, Katson continued, and "will end up possibly siding with people that they would've gladly have pushed off a cliff before." The experience of scripting a game, especially one as unique as City of the Shroud, is a world away from writing a novel. Aside from requiring vast amounts of writing in a very short time, it also requires the writer to let go of the story and allow others to shape it. Abyssal Arts ran a small beta pilot earlier this year, with a different main character and much shorter chapters than the final game will have. "It was incredible watching that," Katson explained. "When you're writing a novel, you have no idea what people are thinking in the middle of it." Here, though, she was able to see whom people trusted, whom people sided with, just as the story was beginning. Character art for the "Duelist" class. The test run allowed the team to tweak the way they introduced characters. One early problem they found was that gamers, perhaps conditioned from a lifetime of simpler, objective-based stories, were all making the same, dull decisions. "Our players are too practical, and sensible," Katson explained. "We have all of these fun characters, and sure, they're charming sociopaths, but they are charming, y'know? Players just did not trust them and did not want to ally with them." This isn't a novel, though. If the team feels that people aren't understanding a character fully, they can change that. Got an inherently untrustworthy character that people blindly trust? Throw some more clues their way. "I would say it's different writing this, not just because of the medium, but because I have that feedback," Katson said. "Feedback" seems to be key here. Or maybe "feedback loop" is more apt. Based on what players do, Katson will continue developing the city, pushing the story forward, only for players to react again and send things in another direction. Throughout it all, one recurring character in the game will talk about the city as a whole whenever you meet him. Every time, he'll relay the current state of play based on real-time data -- which factions are strongest, which are growing in influence and which are shrinking. Small touches like this, it's hoped, will give a sense of Iskendrun as a living entity. In addition to creating a real-time experience for gamers, Abyssal Arts needs to make sure the game stays interesting. Each chapter is going to be "alive," as it were, for only a couple of months or so. The team needs to factor in players coming late to the party, or those who want to replay the game from another faction after the fact. "We don't want this to just be a compelling story because you're influencing it," White said. "We want to make sure the story itself is compelling enough -- that you can watch choices ripple through this world. It needs to remain this very multifaceted world." City of the Shroud is very, very ambitious -- especially as it's the first game from a small studio. It'll be released on PC and Mac in four chapters (you only pay once; the other chapters will come free) over the course of a year. "We wanted to strike a balance between keeping updates at a regular pace and what we can handle as a team," said Keaton. That means managing a game release, bugs, balancing and community management all while writing what needs to be a captivating, dynamic story. And that's without factoring in server management: aside from the story mode, players can face off against each other in online battles, something that'll require upkeep and tweaking of its own. It's a gargantuan task. This project could completely fail. Any title with such lofty aspirations runs that risk. But from a couple of hours playing through an early beta provided by the developers, it's clear there's a solid game here already. Battles are exciting, and unlike anything I've played through before. The characters are interesting, and the dialog is (unsurprisingly, given the author involved) well written and engaging. It's not exactly beautiful right now -- animation is a little choppy, and the UI is full of placeholders -- but that's to be expected at this point in development. The first chapter of City of the Shroud should come at some point before the middle of next year. And after that, the real work begins.